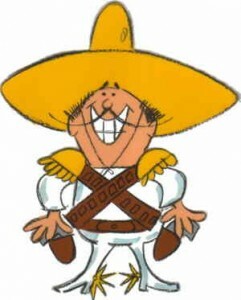 On Saturday Mornings during the commercial break in between the Road-Runner and Bugs Bunny cartoons, there used to be this little guy trying to convince me to eat a certain kind of corn chip. Now he fought for his time amongst the sugar cereal giants of Count Chocula, Lucky Charms and Fruit Loops but as a true Bandito, he secured his share of the market! This guy was going to steal and eat my corn chips if I didn’t keep a careful watch or a “Hawk Eye” on them. His name was the Frito Bandito, “Ah- Yi- Yi- Yi”! Now in this New-New Year and on this Eve-Eve of Nativity, I want to warn you about another bandito, known as the Poco-Bandito. This “little bandit” steals your precious time day after day. He distracts you from things that are of great importance to waste away on his fattening treats. He is well invested in cable TV, the internet, pages and pages of books, video games, work, and even sleep! You see, all that is, is God’s! We were formed from the dust of this earth to worship God. There are no healthy substitutes! We must harness our free-will that is easily deceived and rekindle our relationship with our Creator! In this New-New Year let us increase our earthly existence as Orthodox Christians! We cannot be healthy giving God what is left-over, giving to God the only time we have available because we are allowing earthly distractions to rob us of our treasure. Make a commitment to push closer to your tithe, which is supposed to be your first fruit, not what is left over after the rent, cable and cell phone bills are paid! He also needs your time and talent! We need 2 Youth Sunday School classes and an Adult Class as well. We need teachers and substitute teachers to fill in so we can ensure that in this opportunity we do not allow the Poco-Bandito to steal away our precious jewels, our children. Galatians 6:10 “As we have therefore opportunity, let us do good unto all [men], especially unto them who are of the household of faith.” We need more room so we can increase this ministry! There are homeless shelters and soup kitchens needing volunteers. There are people that need someone to care about them enough to take time to call and visit or send a card! We are family!! We need volunteers to head up our trapeza and clean our church and empty the trash and shovel the snow! We need someone to arrive at 9:45 and greet people when they arrive and someone to sell candles as well! We should also try to read the Bible daily. This is so easy now with the internet and apps for our smart-phones. It only takes a few minutes a day to read the Epistle and Gospel selections. Or you can chose to read the Bible from front to back! You see, we must also tithe our time! You are invited to a wonderful party every week! You see, every time the church doors are open, there is a party! Don’t be a party-pooper! Matthew 9:37 “Then saith he unto his disciples, The harvest truly [is] plenteous, but the labourers [are] few. “ All you have to do is volunteer, and He will help you love your church through service! I ask you at the dawn of this Nativity to increase your Orthodoxy! To seek more of what is right and true and not let the world’s Poco-Bandito embezzle the very priceless gift that God gave you, your soul. Previous Previous post: No Trespassing!